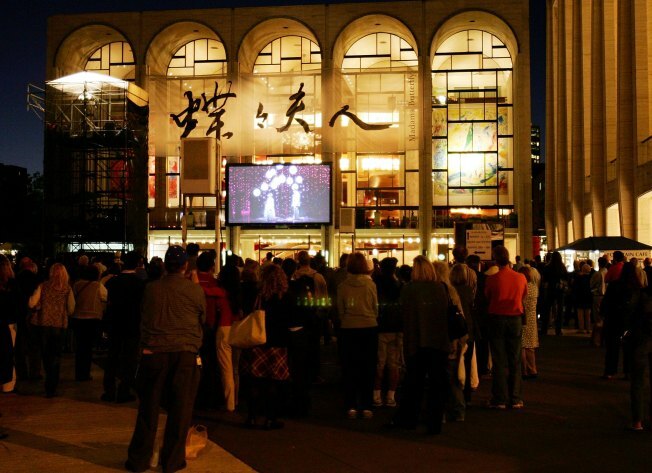 Opera fans watch "Madama Butterfly" on an outdoor television screen at Lincoln Center. The Metropolitan Opera is replacing its live summertime park productions with simpler recitals and a 10-day "festival" of outdoor HD screenings. This is sad news for the scores of people who pack up their blanket and wine to enjoy the outdoor opera each summer. This year, Met productions originally telecast live in theaters worldwide will be shown free of charge in Lincoln Center Plaza, starting Aug. 29. The economic crisis has not spared the Met. In past summers, the company offered live performances that included a full orchestra, chorus and soloists -- costing much more than screenings from the Met's "Live in HD" productions. The six live recitals start July 13 in Central Park with baritone Paulo Szot, joined by a soprano and tenor. Szot currently stars in the musical "South Pacific" at the Lincoln Center Theater.